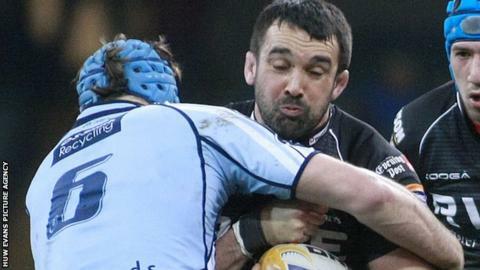 Former Wales back row Jonathan Thomas says players need to take more responsibility if they suffer head injuries. Worcester's Thomas, 32, has retired after he was diagnosed with epilepsy, which is thought to have been triggered by multiple head traumas while playing. Thomas said players are purposely playing down the seriousness of their injury to prolong their careers. "It's probably the players that need the biggest wake up call," Thomas said. "It's one thing the Unions driving things and the medical departments being really professional, but it's another thing getting it through to players who have a gladiatorial mind-set and want to get on the field and play. "There are definitely players out there who try to tone down their symptoms in order to keep playing." Thomas, capped 67 times by Wales and a Grand Slam winner in 2005 and 2008, is the latest player forced to quit on medical grounds. Cardiff Blues flanker Rory Watts-Jones was advised to retire in February after a concussion-related injury that prompted behavioural changes. England internationals Shontayne Hape and Andy Hazell have also been forced to end their careers prematurely because of concussion. "A lot's been highlighted in recent times about the physicality of the game and potentially these sort of [head] injuries. It's a shame for JT. When he was involved with Wales he was player we had a lot of time for and no-one wore that jersey with more pride. You've got to feel for him and I want to wish all the best." Wales head coach Warren Gatland has warned "one or two more serious knocks" could end wing George North's career. North suffered four blows to the head in a five-month period last season, which Thomas says highlighted the issue to a wider audience. "It's a very good thing it's highlighted more," Thomas told BBC Wales Sport. "I think it will take a generation of players to really educate them on the dangers of playing with trauma and bangs to the head. "I've learnt a lot myself over the last few months and a lot more educated about it and in the future I'd like to educate players and teams." Thomas played 44 games for Worcester after joining from Ospreys in May 2013 and was part of the side that gained promotion back to the Premiership at the end of last season. He was diagnosed with epilepsy last year but decided to continue playing after being told the condition could be managed. However, Thomas now feels he has to stop. "I think you always think you're indestructible," Thomas told BBC Wales Sport. "When I found out I thought I'm just going to roll my sleeves up and take it on as just another challenge. "When I found out it was potentially manageable with medication that was all I needed to give me that incentive to carry on. "I went on to play 19 games last season but living with the side effects, training and playing it was mentally tough. "After games I would be a lot more fatigued than I used to be and I was getting little things like memory loss. "Speaking to the consultant and him advising me to finish was the final nail in the coffin."